After the multi platinum success of the Finnish band NIGHTWISH I became prejudiced against almost every female fronted band that was using the soprano female vocals against the harsh male ones. For that reason, I wasn't familiar to EPICA except from the beautiful Simone Simons who had collaborated with the power progsters KAMELOT in the The Black Halo opus. My first official contact with the Dutch act took place in Greece's March Metal Day festival where EPICA performed as a supporting band to MANOWAR. That performance helped to see further from NIGHTWISH's heavy shadow and realise that this EPICA had some very interesting ideas and very powerful songs. 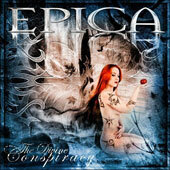 Nuclear Blast Records who offered the band a record deal in April will release after almost five months EPICA's new discographic step entitled The Divine Conspiracy. As I said I was a little bit skeptic prior to the first CD spin in my player thinking that EPICA will try to take NIGHTWISH's place especially when the Finnish had parted ways with Tarja. The short orchestral intro Indigo gave its place to fast paced The Obsessive Devotion and Simone's wonderful voice. I became quite surprised by the male vocals that had a distinct Death Metal direction. This adds greatly to EPICA's dynamic by joining the fast and the melodic parts with male growls and soprano etherial vocals, respectively. Actually, Mark Jansen has taken his aggressive vocals towards the Black Metal territory by borrowing some high pitched screams and growls. This vocals change had also an impact to the music itself where the Black Metal blast beats and breaks come to surprise the listener in songs like Menace of Vanity or Death of a Dream. The songs are more guitar driven with fast and shredding riffs that really bring more aggression besides melody. Some Eastern melodies can be found in Fools Of Damnation where Simone reveals her multi-personality vocals. Beyond Belief and Sancta Terra follow a more mainstream path with a groovy rhythm section, emotional female vocals and really catchy choruses while the classic piano one-voice recipe in Safeguard to Paradise slows things down. The best track of the album is the closer and homonymous epos that conts almost 14 minutes in time duration. The song comprises tempo changes, the beauty and the beast vocals and an orchestral arrangement with classical instruments. In this moment the excellent sound production of Sascha Paeth deserves some credit by putting together all this elements without loosing in terms of power of melody. It is more that safe to say that the new EPICA album managed to clear away all the clouds of prejudice and doubt that were disturbing my disinterested judgement. In this mental situation I can assure you that this very good album will definitely meet your expectations and will probably make you think the king is dead, long live the king.